If you’re the parent of a special needs child in a wheelchair you may be realizing that you have a problem in your home: stairs! Maybe there are a few steps to get in your front door and maybe your child’s bedroom is on the second floor, up another flight of stairs. We had another problem too: the only bathroom in our house was upstairs! 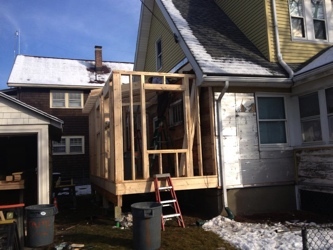 If you’re like us you might be thinking about making your home accessible for a child in a wheelchair, and that will probably involve major construction. 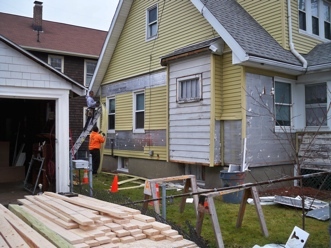 Home modification projects are pricey, but often necessary. We did it and survived to tell the tale! We also found funding for the project so we didn’t have to pay for it ourselves. Here’s what we did…. You might not want to talk to a contractor until you’re totally ready to start building, but I would suggest getting a good contractor lined up first. We found our contractor through word of mouth (he was highly recommended by friends and neighbors) and we knew we could trust him (A. Cosco & Son—if you’re in the Boston area, check them out!). He walked through the house with us and we told him what we wanted and he was able to advise us on what was possible and approximately how much everything would cost. This was a great place to start so we could get an idea of what we wanted to build and how much money we would have to raise. Our contractor also brought over an architect who measured everything and drew up plans. With a strong idea of what we wanted to build and detailed plans we were ready to start raising money. 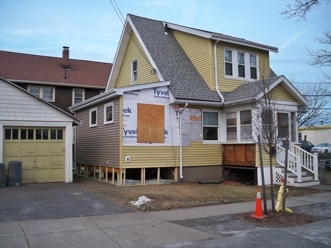 Our contractor knew that it would take us some time to get the funds together and he was fine with putting the project on hold until we were ready. Since we knew what we wanted to build (an accessible bathroom downstairs and a wheelchair ramp leading to our front door), our contractor was able to write up a quote for us. I knew that we would have to look at multiple funding sources, so I asked our contractor to write three quotes: one for the whole project, one for just the bathroom and one for just the ramp. 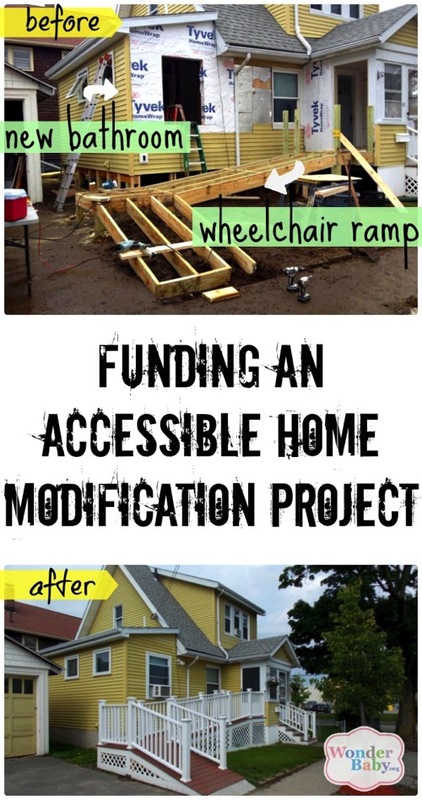 That way if I found a grant that only funded wheelchair ramps, I already had a separate quote to show them. You will also need to get a second quote on everything, so best to do that now! Even if you like your contractor and know you’re going to go with them, you’ll still need to get a second estimate from another contractor. Having that all done ahead of time will really streamline your fundraising! Another good thing to do before you start applying for loans and grants is to collect all the necessary paperwork. Get a nice big folder and put copies of everything in one place. If you have a scanner, create digital copies of all your paperwork and keep that in a folder on your computer. When someone asks for your deed or a doctor’s note, you can just send them an email with an attachment… no problem! Make sure you get a copy of the license for the second contractor too! Might as well get two of those doctor’s notes if you can! How about asking your child’s PT for a letter too? Whew! Are you tired yet? Don’t sound desperate and don’t apologize for asking for money. I know it feels weird to ask people (total strangers!) to give you money, but you need it and it’s for a good cause. AND remember this: THIS IS WHAT THEY DO! The organizations you’re contacting raise money just for people like you. You’re not bothering them by asking them to help you financially. Explain Your Child’s Disabilities: Explain in real terms what your child’s diagnosis is and how it effects him at home. 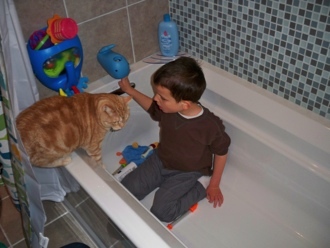 Why do you need to modify your home for your child’s needs? Explain Your Project: Outline what you will be building and how much it will cost. Other Funding Resources: List all of the organizations that you have contacted or that you plan to contact. List which ones have provided funding (and attach notes proving that you have received or plan to receive that funding). Organizations love to see that you are getting help from multiple sources and that their contribution is going to be part of a bigger project. Contacts: List people related to your child that the organization may want to contact, such as your child’s pediatrician, their social worker or their Special Education coordinator. Chances are they won’t contact anyone, but it’s nice to see them listed. Permissions: Give the organization permission to use your story in fundraising efforts in the future. Include a family photo and give them permission to use that too. Also give them permission to contact everyone you listed as contacts in the section above. Want to see how an example letter? Here’s our basic letter that we used to send out to multiple organizations when we were raising money and applying for grants. I would alter the letter a little bit each time to fit the needs of the grant we were applying for. Honestly, by this point you’ve already done the hardest part. You know what you’re going to build and who’s going to do the work. You know how much it’s going to cost and you’ve collected all the paperwork you’re going to need. All you need to do now is find the grants you want to apply for. Where do you start? This list will be different for everyone based on your needs, your background and where you live. Start by asking around in your community. Do you belong to any groups, clubs or a church? These places may have small amounts of money to give and they may know about other local organizations who grant money to families. Also, ask your contractor. They may have done work in the past that was funded by a local charity. Our biggest check came from a small local charity that raises funds specifically for accessible home modification projects in our town. How did we find them? Our contractor had done work for them! Another huge source of funding is your state. Call your Department of Developmental Services (or equivalent, these departments have different names in different states) or your state’s Commission for the Blind. Ask your social worker or SPED director. Chances are there is a home modification loan program in your state. In Massachusetts, we used HMLP which loans money based on income. They will give you up to $30,000 and if you meet their income guidelines the loan is interest free and only has to be paid back when you sell your home. If your income is too high, then you can still get that $30,000, but it becomes a low interest loan that needs to be paid back in 15 years. Many states also have a Catastrophic Illness in Children Relief Fund (CICRF) that will pick up expenses that other grants and loans don’t cover (they say they are a “payor of last resort). Need more ideas for charities and organizations to contact? Check out this list of over thirty fundraising contacts from our article on raising money to attend family conferences. As you send out your applications and hear back from programs, be sure to let other programs (and your contractor!) know where you stand. You will most likely need a lot of money to fund your project and you will most likely not get all that money from one source, so be prepared to contact a lot of people and to keep those people updated with how your fundraising efforts are going. Last Step: Write Thank You Letters! Keep a record of everyone who has helped you along the way and be sure to send everyone a little thank you note when the project is completed. Include a photo of the final project if you can—people love to see the outcome and know that they had a hand in something good!